lady getaways, wine nights, and endless conversations make up the foundation of this friendship. equal parts om and wild, she is shining ray of goodness. sister to tyler and friend to erin, liz shares tyler love for the great outdoors, new england and good laughs. her creativity and craft skills are second to none. kind-souled sister from another mister. gracious and considerate bestie from high school who values family and her people. professional turned personal friend from day one at our first adult jobs. creator of beautiful things inspired by the beauty of nature. steadfast, loyal and alway up for adventure. old roomie and comrade in late night kitchen catchups. shinning ball of goodness and positivity. the best cheerleader for every fun and tough moment in life. family vacation and holiday partner-in-crime (aka wine drinking buddy). patient, kind, and the most wonderful addition to the mcbutner family. he has been around since day one and knows tyler all too well. a free spirit, an aesthete, and an adventurer. a brother. highly intelligent and an inspiration. his dry wit and glint in his eye are to be sought and cultivated. the brother tyler never had. complete with an understanding and stories that truly only come with being family. an encyclopedia and one of the funniest people in this world. a true friend that no one should ever be without. good stories always start with Jamie. all around a top notch man, of which can be in short supply in this day and age. an inexhaustible spirit and energy. a breathe of fresh air. ready to take it to the limit all the time. one thing you should know about brad: he gives great advice. the first time erin told brad about her relationship with tyler, he said, "whoa... you should probably marry him." full of wisdom beyond his years, wit, and an insane passion for making the world's best playlist, there is no one more apt to make the union official. she was a colorado girl who fell for an east coaster. (like mother, like daughter). it was the 1970's and he had just pulled up in VW van to rocky mountain national park. like minds and love for the outdoors solidified this relationship. she stole his heart, but as she'll tell you, opted to keep her "good strong Irish" name. 35 years and two kids later, they've adventured across the globe, lived in oregon, but always find themselves returning to colorful colorado. 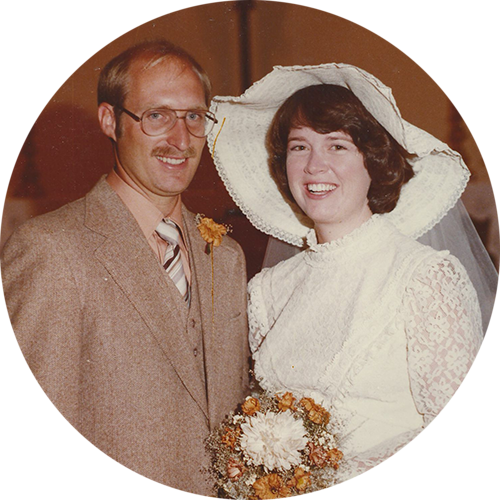 they met at a christmas party in newport during the winter of ’76. as they left she giggled at his sun-burnt orange BMW 2002 tii and he laughed at her gold VW super beetle. just shy of two months later they were married on valentine’s day. during their 37 years together they have provided a wonderful upbringing for two children and many dogs in a lovely home in newport. aren't they cute? we know no family is complete without a four-legged friend.